Amorphis is the headliner for the final day of this year’s Maryland Deathfest. While we usually try to review albums by bands playing MDF that people might not know yet, this is an exception because Amorphis will actually be playing this entire album as their set at MDF. Tales from the Thousand Lakes is based on the Finnish epic poem, the Kalevala, and it just so happens DCHM writer Tal is a Finn with a knack for historical context. You (hopefully) already know the great songs on this classic metal album, but here Tal does an excellent job explaining the back story and how it relates to the music as well. You can read more of Tal’s writing on his blog In My Winter Castle. So continue to get ready for Maryland Deathfest XIII with us (this year’s MDF Survival Guide should be up Monday!) and don’t forget to check out the tunes at the end of the post as well! During their set headlining the Edison Lot on Sunday, May 24, Amorphis will be playing the entirety of their influential album Tales from the Thousand Lakes. This exclusive appearance will also be their first U.S. performance since a one-off show with Nightwish in 2012; they haven’t actually toured the U.S. since 2008. Having missed them at Tuska Fest in Helsinki, Finland in 2011, I’m glad for another chance to see them live. 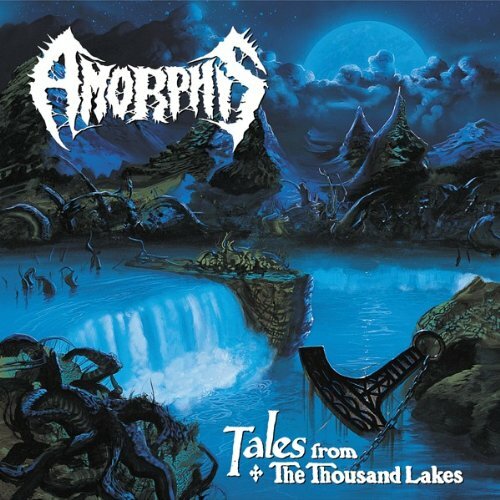 Released in 1994, Tales from the Thousand Lakes was Amorphis’s second full-length album and was a game changer for death metal, bringing more melodic and doomy elements into the genre. I owe a hitherto unacknowledged debt of gratitude to Amorphis and this album, seeing as my favorite genre is melodic death/doom. Yet my exposure to Amorphis has been fairly sporadic. When the mood strikes me for something sad, beautiful and heavy that will lift me up by dragging me down, I usually reach for Insomnium or Swallow The Sun, or perhaps Doom:VS or Katatonia’s Brave Murder Day if I really want to bring on the moping. Amorphis never really occurred to me as that sort of band. The Amorphis I’d heard was that of “Silent Waters” or “House of Sleep” – melodic and beautiful to be sure, and heavy, but more in a rock than a death metal way, and sad to a point, but not quite as mournful or gloomy as the lovely misery that I craved. Tales from the Thousand Lakes doesn’t really plumb the depths of doom, either – after all, it’s based on Finland’s “national epic,” the Kalevala, so it has more of a magical and mystical vibe than a funeral one. Magic and mysticism with heavy, distorted guitars and death growls, that is – but that’s pretty suitable, seeing as Finland is not only the land of the midnight sun, but also of black winter days. The Kalevala is not the happiest of epics, either. The central hero, Väinämöinen, doesn’t get the girl, nor the magical item that he seeks, and basically leaves the world in disgust at the end of the story. However, he does leave his people with his greatest legacy, the kantele — a type of zither whose delicate, melancholy notes are the perfect accompaniment for extolling one’s sorrows in song, as Finnish folk songs are wont to do. As one of the first metal albums devoted to the Kalevala, Tales from the Thousand Lakes was also among the founding albums of the folk metal genre. The Kalevala is a collection of folk songs gathered by the doctor and scholar Elias Lönnrot from the Karelia region, and the best-known version was published in 1849. His work (and others’ around the same period) not only preserved a vast body of folklore that was quickly being lost as newer entertainments gained ground, but was also intended to fuel Finnish nationalism, laying the groundwork for Finland’s struggle for independence from Russia. The epic tells of the creation of the world from a duck egg; the birth of the shaman Väinämöinen, who creates trees and other forms of life; his struggle with various adversaries, most notably Louhi, a witch who rules the northerly land of Pohjola; his constantly thwarted quests for a wife (“Drowned Maid” tells of Aino, sister of Väinämöinen’s enemy Joukahainen, who drowns herself rather than marry Väinämöinen); and of course, his creation of the kantele. Some other notables are the smith Ilmarinen, who forges the mysterious magical Sampo; the mischievous Lemminkäinen, who gets in so much trouble that he has to be brought back from the dead at least once (“Into Hiding” is about Lemminkäinen’s escape from Louhi’s clutches); and the miserable Kullervo, who is separated from his family and eventually commits suicide after realizing he seduced his long-lost sister. Amorphis directly excerpts parts of the Kalevala, from the 1989 translation by Keith Bosley, as lyrics for most of the songs on Tales from the Thousand Lakes. For instance, “Black Winter Day” is the Maiden of the North telling of her sorrow as she must leave Pohjola to wed the smith Ilmarinen. The bride’s sorrow is a common theme in Finnish folk music, as she is separated from her family and will see them again only rarely, and must leave behind carefree childhood for the burdens of adulthood. It makes for a great doomy song. “This is how the lucky feel / How the blessed think / Like daybreak in spring / The sun on a spring morning,” the maiden begins. And yet, she cannot feel happy. For someone who doesn’t know the origins of the lyrics, it seems like a song about depression – I should feel happy, yet I can’t. As a feeling that many metalheads can relate to, this may be part of the appeal of this song, which is probably the most popular one from the album, and certainly my personal favorite. Another part of the song’s appeal is surely the confluence of melody and heaviness, doom and death metal, in this song. A melody that is at once mournful and bright swirls around the listener, underpinning the whole song, and contrasting with the low growled vocals and drearily plodding guitars and drums, like the maiden dragging her feet as she walks to Ilmarinen’s sled, unable to feel happy on what should be a joyous occasion. The album pioneered the use of such melodic and doomy elements in death metal, laying the groundwork for a whole new subgenre of metal. Tales from the Thousand Lakes was one of the first death metal albums to use a keyboard or synthesizer so extensively, and it’s very effective in creating a magical and haunting atmosphere. The album starts off with a keyboard intro that sets the doomy and melancholy mood, and then adds some synthesized voices, tinkling sounds and bells that give a sense of mystery and grandeur. While keyboards are featured in all of the songs, they come to prominence in a few places. In the middle of “Drowned Maid,” they add orchestral feel and drama. And in the second half of “Magic and Mayhem,” there’s a chiptune-like segment that seems out of place at first, it’s so antithetical to death metal and at odds with the alternating doomy or buzzsaw riffs that preceded it, but when it’s played over the death metal riffs and harsh vocals for a few seconds at the end of the song, it works well, adding an extra bit of frenzy. Many of the songs feature shifts in tempo and mood. This is most apparent in the song “Forgotten Sunrise,” which goes from a melancholy doomy intro, to a more energetic and melodic sound, then a low and churning death metal sound once the vocals begin, followed by a psychedelic synth segment in the middle, and then continuing to alternate upbeat melodic parts and low churning parts till the end. Considering that they were doing something brand new at the time, mixing melody, doom and other influences into death metal, it’s not surprising that they jump from one sound to another. There’s a sort of swirling, mystical sound to the doomier guitars and the keyboards that ties the whole album together. The song “The Castaway,” which tells of Väinämöinen floating on the sea after being defeated by Joukahainen, is dominated by this sound. The rising and falling lead guitar and keyboard evoke the surging of waters of the sea, as well as the circling of the eagle who comes to rescue him. Although later bands combining death and doom plunged heavily in the direction of melancholy, Amorphis’s foray in this direction remains unique in its exploration of mystery and magic. Clearly, just as the epic it’s based on stands out in my country’s history, so Tales from the Thousand Lakes holds a special place not just in the history of metal, but also the hearts of the band and their fans. Don’t miss these ten songs, brought together as an epic in the book of heavy metal, at this year’s MDF. Great article for a great album for a great band. Greetings from Chile.